I just took a look at their full download selection. The first thing that jumped out at me was the "Animated Explosion FX" model. Then I noticed all the textured models and read a few descriptions. None of these models have been created for 3D printers. Looks like they just scraped a 3D animation site and dumped the results into their store. Many of these won't print at all. The explosion for example is a well known effect that involves no actual geometry. I suspect most of the rest would require a significant amount of editing first. Not to mention that much of the details are the results of image maps and not geometry or deformation. 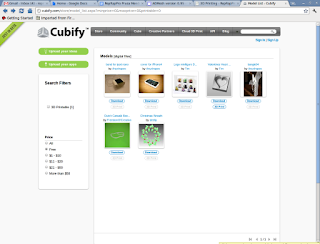 God help the 3D printing community if Cubify actually gets some real press. The backlash would taint the public perception of 3D printing for the next decade. Although is someone has $25 sitting around I'd suggest ordering a print of the explosion from them. Love to see what they say about it. I think that they are late and not very good too. But how much better than attacking them would be treat them as a rather dumb resource? If we were to flood their site with RepRap stuff that actually does print, and that makes RepRaps in their machines, that would surely be much more entertaining? I believe some of those effects on the cubify site like the Explosion are just models that once you buy you can download. I just went through the purchasing process without actually finishing and it informed me I was purchasing a digital model NOT a physical printed object.